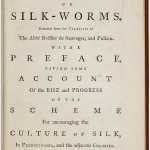 Excerpts from Samuel Pullein’s The Culture of Silk (1768) were republished in a number of American magazines, and also in Directions for the Breeding and Management of Silk-Worms (1770), a Philadelphia pamphlet on sericulture. Excerpts and reprints helped to circulate the expensive work to a broader audience. Pullein’s lengthy treatise not only explained how to hatch and raise silkworms, the larvae of the domesticated silk moth, but also how to maintain their food source, the mulberry tree. Roughly half the book is devoted to insect care, with the remainder concerned with extracting silk and making it viable for export. Nonetheless, entomological knowledge was necessary throughout. The manufacturing half of the book, for example, explains how best to destroy moth pupae; careful handling and understanding of the insect’s life cycle allowed Philadelphians to carefully unwind cocoons and reel silk filaments onto a spindle. Pullein’s instructions proved to be very popular, and in 1769 Dr. Cadwalader Evans wrote to Benjamin Franklin for advice on introducing silk production to Philadelphia. Franklin suggested the creation of a public filature, an establishment for reeling silk from cocoons. By 1770, Evans and other prominent Philadelphians had organized a silk society. The following year their filature reeled 155 pounds of silk for export. Although the scheme ultimately failed, Philadelphians’ fascination with insects was just beginning. One of the earliest insects to catch Philadelphia society's attention was Bombyx mori, the domesticated silk moth. Silk moth cultivation, or sericulture, dates to the Neolithic era in China and subsequently spread across Asia and Europe via the Silk Road. Silk is produced from the fine filament of the silk moth's cocoon. 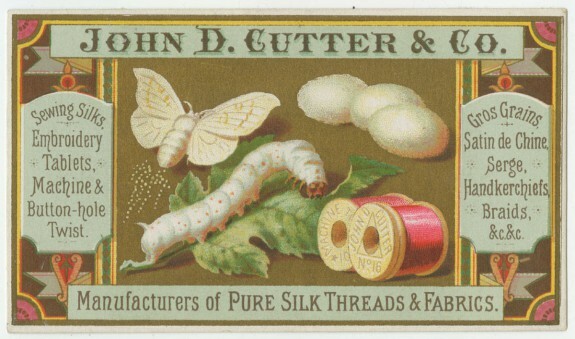 This nineteenth-century advertisement for a Paterson, New Jersey, silk mill shows several of the silk moth's life stages, including three cocoons in the upper right corner. 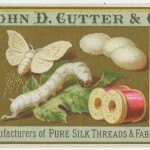 Attempts to start a viable silk industry in North America began in the seventeenth century, a few years after the founding of the first English colony on the continent, but even during peak years just prior to the Revolution, yield was low despite bounties paid for planting mulberry trees in the colonies on which the silk moths could feed. Philadelphia's silk industry began in 1770, when Dr. Evan Cadwalader began a silk society in the city to raise funds for a filature, a device for reeling silk, on the advice of Benjamin Franklin. It was constructed at Seventh and Arch Streets and opened to the public in June of that year. About 155 pounds of silk was produced at the filature in 1771, but the nascent industry was interrupted by the Revolution. Not necessarily reliant on native production, silk would become an important part of Philadelphia's economy in the nineteenth century, when mills in the Kensington neighborhood churned out silk garments for eager consumers. Thomas Say's interest in entomology developed early. He was a relative of the famous naturalist William Bartram and spent his youth collecting insects at Bartram's garden in Kingsessing. In 1812, Say and six of his friends founded the Academy of Natural Sciences, after which he abandoned his other professional interests and focused exclusively on natural sciences. He was a member of several expeditions to the southern and western areas of the country, naming hundreds of new species of insects as well as birds and mammals, before returning to Philadelphia in 1821 to become the curator of the American Philosophical Society. He began to teach natural history at the University of Pennsylvania the following year. In 1826, Say and other Philadelphia scientists journeyed to the utopian community of New Harmony, Indiana, traveling by boat down the Ohio River from Pittsburgh. In New Harmony, Say became head of the community's educational programs and wrote his two major works, American Entomology and American Conchology. He died of typhoid fever in 1834. His wife, Lucy Say, became the first female member of the Academy of Natural Sciences in 1841. Titian Ramsay Peale's primary interest was butterflies. In the 1820s he developed a new method for displaying specimens. Traditionally, they were mounted on a pin so they could be viewed only from above. Peale instead mounted them on a wire stuck into a small disk of cork, then encased them in a slim glass box. These “book boxes” allowed scientists and hobbyists to view both the top and underside of the butterfly. Peale's father, Charles Willson Peale, owned the Philadelphia Museum, which operated out of Independence Hall, and displayed his creations. Today Titian Peale's collection is in the Academy of Natural Sciences of Drexel University. 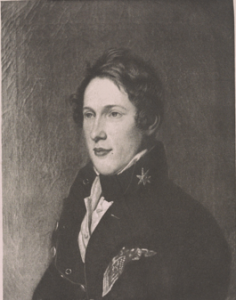 Titan Peale also illustrated Thomas Say's American Entomology and served as chief naturalist for the United States Exploring Expedition, during which he collected new species and sent them back to Philadelphia's museums. Perhaps the most well-loved members of the insect world, butterflies have been a favorite of Philadelphia's entomologists. When Philadelphian Mary Peart, along with Lavinia Bowen and Patience Leslie, was chosen to illustrate William Henry Edwards' Butterflies of North America, she chose to base her works on live specimens that she raised in her home. In the process, she learned a great deal about the life and behaviors of many butterfly species, information which she passed on to the scientific community. Butterflies were also the primary interest of Titian Peale, son of proprietor of the Philadelphia Museum, Charles Willson Peale. The younger Peale developed a novel method for displaying butterflies so that both front and back were visible. Butterflies also held important symbolism in the years before the Civil War. 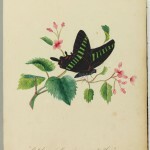 Sarah Mapps Douglass, a prominent African American abolitionist, educator, and founder of the Female Literary Association, drew this illustration of a female black swallowtail for Amy Matilda Cassey’s friendship album. Butterflies had often been used as symbols of freedom, and Douglass’s choice to render hers as both black and female was a poignant choice that spoke also to her scientific knowledge of insects. Douglass's drawings are some of the earliest signed paintings by an African American woman. 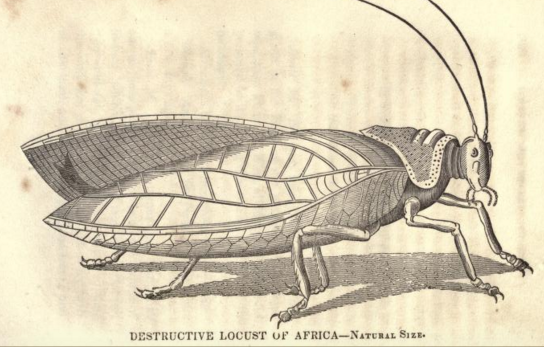 Entomology, even in its early days, was not an exclusively male realm. Philadelphia native Mary Townsend was born in 1814 and had a lifelong interest in the behavior of insects. Townsend suffered from several debilitating illnesses that left her bedridden, and it was during one of these illnesses in 1844 that she penned Life in the Insect World, which was published anonymously. It was written as a series of conversations between an aunt and her nieces on insect behavior and structures based on Townsend's own research and conversations with other entomologists. Townsend, a Quaker, was also an abolitionist and wrote a children's book for the 1846 Anti-Slavery Fair with her sister Hannah. Entomology is a branch of zoology concerned with the study of insects, the most diverse lineage of arthropods. 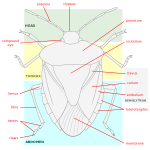 True insects possess a chitinous exoskeleton, six legs, and a tripartite body consisting of a head, thorax, and abdomen. Historically, entomologists studied a number of other creatures that now fall outside of this definition, but are still known colloquially as “bugs” (e.g. spiders, scorpions, centipedes, millipedes, snails, and worms). True insects are the most diverse group of living things on the planet, with beetles alone representing one-fifth of named organisms. 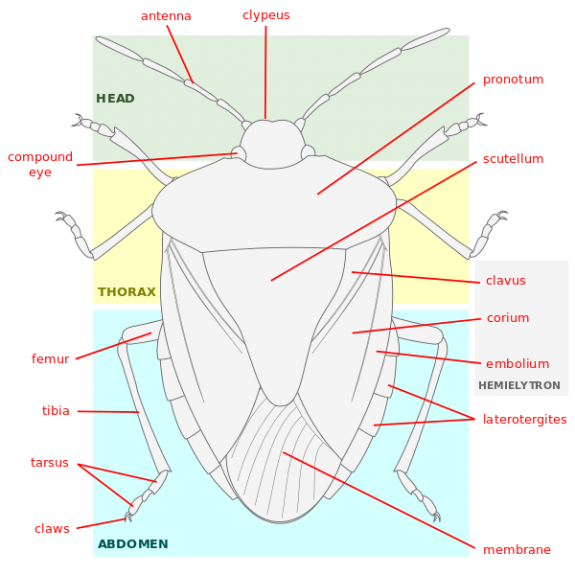 This is a diagram labeling the body parts of a species of suborder Heteroptera, commonly referred to as the true bugs. Philadelphia and its nearby vicinities became important sites for entomological study by the nineteenth century due to the presence of the Academy of Natural Sciences (established in 1812) and the American Entomological Society (1859). Entomological writing and illustration also flourished in this center for book production. Over time, entomologists’ interest in insects shifted from the practical and taxonomic to become more focused on ecology and educational outreach. Eighteenth-century Philadelphians often expressed scientific interest in insects in relation to agricultural or economic matters. In 1768, Samuel Pullein (fl. 1734–68?) 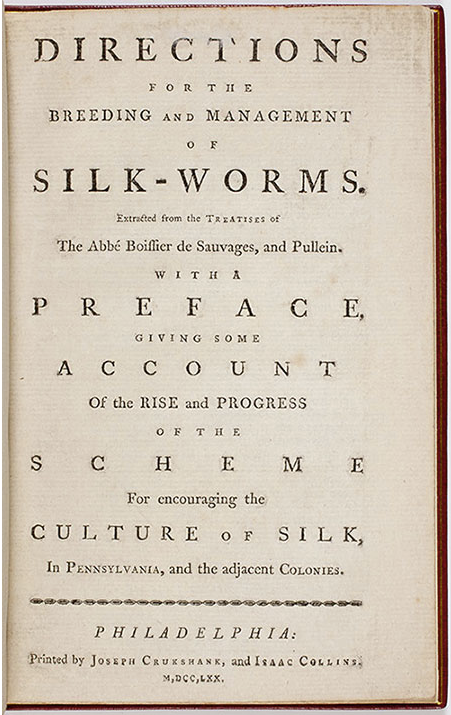 published The Culture of Silk to encourage American silk production. The treatise explained how to rear silkworms, the larvae of the domesticated silk moth (Bombyx mori). 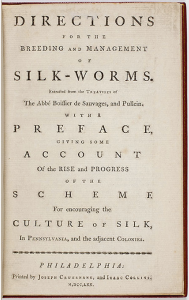 Pullein’s instructions proved to be very popular, and in 1769 Dr. Cadwalader Evans (1716–73) wrote to Benjamin Franklin (1706–90) for advice on introducing silk production to Philadelphia. Franklin suggested the creation of a public filature, an establishment for reeling silk from cocoons. By 1770, Evans and other prominent Philadelphians had organized a silk society. The following year their filature reeled 155 pounds of silk for export. Although the scheme ultimately failed, Philadelphians’ fascination with insects was just beginning. 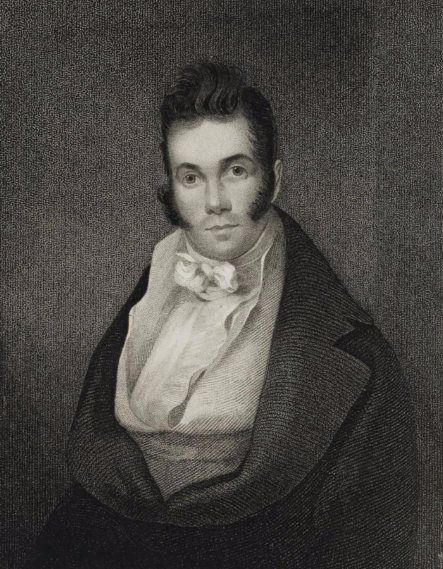 Philadelphia’s early contributions to the study of entomology were largely due to the pioneering work of Thomas Say (1787–1834), a descriptive taxonomist. In 1812, Say joined the Academy of Natural Sciences, which became an important venue for his entomological collaborations, including American Entomology. In the absence of a comprehensive field guide to insects, Say sought to provide descriptions and color illustrations of all known species in North America. Fellow academy members Charles Alexandre Lesueur (1778–1846) and Titian Ramsay Peale (1799–1885) executed many of the drawings. Apart from a preliminary set of plates and descriptions issued in 1817, the three-volume work was printed in Philadelphia between 1824 and 1828. Before his untimely death by typhoid, Say discovered and formally described more than 1,500 insect species. Titian Peale, the youngest son of Charles Willson Peale (1741–1827), was primarily interested in Lepidoptera, the taxonomic order that encompasses butterflies and moths. He curated an impressive collection of roughly four thousand specimens, for which he designed what entomologists call a “book box.” In the 1820s, Peale began hermetically sealing his butterflies in glass boxes lined with tin foil. Entomologists usually preserved insect specimens by pinning them to an opaque surface lined with cork; Peale’s boxes allowed them to study specimens from both above and below by pinning specimens to small cork discs glued to the glass bottom of the box. Peale displayed these boxes at the Philadelphia Museum. 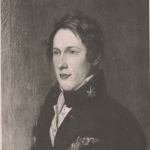 In 1899, the Academy of Natural Sciences acquired Peale’s collection. It is one of the oldest collections of insects in the United States. Concurrently, women produced popular works that diffused entomological knowledge beyond the walls of scientific societies and museums. Philadelphia Quaker and abolitionist Mary Townsend (c. 1814–51) wrote Life in the Insect World in 1844. Townsend emphasized the practical uses or lives of insects, portraying them as diligent workers, careful artisans, and clever tradesmen. In doing so, Townsend argued for cosmic design—even small, seemingly unappealing creatures had purpose and were evidence of God’s goodness. Didactic works that used science to cultivate religious sensibility were considered to be appropriate fare for young women. In 1859, Philadelphia became home to what would become the country’s oldest continuously active entomological society, the Entomological Society of Philadelphia. Prominent founding members included John Lawrence LeConte (1812–97), a specialist in Coleoptera (beetles), and Ezra Townsend Cresson Sr. (1838–1926), a specialist in Hymenoptera (bees, wasps, and ants). Lucy Say (1801–86), the wife of Thomas Say, became a member in 1863. The society produced various publications, including its scholarly proceedings. It also distributed, at first gratuitously and later by subscription, a circular called The Practical Entomologist. This serial aimed to acquaint farmers and agriculturalists with useful entomological knowledge. Content ranged from advice on how to deal with problematic species to the basics of taxonomy. In 1867, the society changed its name to the American Entomological Society (AES). By the late nineteenth century, Philadelphia was home to a number of women illustrators. Local artist Mary Peart, along with Lavinia Bowen (b. c. 1820) and Patience Leslie, primarily illustrated Butterflies of North America by William Henry Edwards (1822–1909), issued in parts between 1868 and 1897. Rather than drawing from dead specimens, Peart raised and observed butterflies in her Philadelphia residence to more accurately draw and color the larval and pupal stages of her subjects. Ultimately, Edwards believed that Peart contributed more to the work than he did. In raising so many insects, she learned and passed on a great deal of information about the life cycles and habits of moths and butterflies. Love of entomology passed from one generation to the next. Two of Ezra Townsend Cresson Sr.’s sons followed in his footsteps and became entomologists, working for periods of time at both the Academy of Natural Sciences and the American Entomological Society. George Bringhurst Cresson (1859–1919), like his father, specialized in Hymenoptera, working as a conservator at the Entomological Section of the Academy of Natural Sciences in the 1880s. Ezra Townsend Cresson Jr. (1876–1948) specialized in Diptera, the order that encompasses true flies. Cresson Jr. became a curator in at the Academy of Natural Sciences. He contributed to entomological publications up through the 1940s, co-editing the Academy’s bimonthly serial, Entomological News, with Phillip Powell Calvert (1871–1961). Under their stewardship, the publication became increasingly interested in the study of species’ evolution to expand classical taxonomy of insects. Meanwhile, rising concern over invasive insect species prompted entomologists to team up with local Philadelphians and the United States government. In 1916, Japanese beetles (Popillia japonica) appeared in Burlington County, New Jersey. Without natural predators, the beetles spread quickly, ravaging crops and ornamental plants. From roughly a dozen insects, their numbers escalated to one thousand quarts of insects captured largely by local children, during the summer of 1920. By 1923, and despite the efforts of entomologists, the infested area spanned seven hundred square miles with no sign of abatement. The situation prompted the U.S. Department of Agriculture to form the Division of Japanese Beetle Control in 1928; in 1933, in an early biocontrol effort, researchers produced the first commercial microbial pesticide, Milky Spore, first detected in New Jersey. By the 1940s, various branch offices littered the state; the Philadelphia office was responsible for quarantining beetles in the eastern third of Pennsylvania. Japanese beetles remained an invasive pest into the twenty-first century. Interaction with the public was not limited to invasive species. Although the Academy of Natural Sciences and the American Entomological Society continued to foster entomological research well into the late twentieth and early twenty-first centuries, by the end of this period, the two institutions increased efforts to educate young children. In 1986, the AES established the Calvert Award for young entomologists in honor of former AES president Dr. Phillip Powell Calvert. AES additionally offered an Insect Field Day for school-age children in conjunction with the Academy of Natural Science’s two-day Annual Bug Fest. Visitors to the Academy of Natural Sciences’ museum could enjoy the live butterfly exhibition in addition to its impressive collection of preserved specimens. Other entomological exhibits geared toward children also emerged. In 1992, the Insectarium, a museum of live insects, opened in North Philadelphia. Though the goals of entomological study were varied, throughout its history, Philadelphians maintained a steady interest in insects. By the twenty-first century, outreach efforts worked to preserve this fascination among future generations. Haltman, Kenneth et. al. 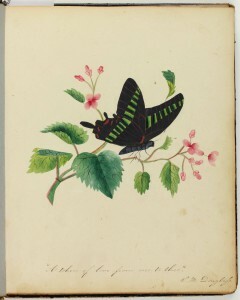 The Butterflies of North America: Titian Peale’s Lost Manuscript. New York: American Museum of Natural History, 2015. 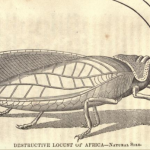 LeConte, John L. The Complete Writings of Thomas Say on the Entomology of North America. New York: Baillière Brothers, 1859. 2 vols. Peck, Robert McCracken. A Glorious Enterprise: The Academy of Natural Sciences of Philadelphia and the Making of American Science. Philadelphia: University of Pennsylvania Press, 2012. Stroud, Patricia Tyson. Thomas Say: New World Naturalist. Philadelphia: University of Pennsylvania Press, 1992. 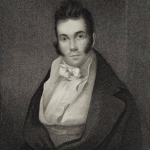 John L. LeConte Papers and Peale Family Papers, American Philosophical Society, 104 S. Fifth Street, Philadelphia. Peale Family Papers, Historical Society of Pennsylvania, 1300 Locust Street, Philadelphia. William Henry Edwards Collection (Coll 964) and Lucy Say Papers (Coll 433), Academy of Natural Sciences, 1900 Benjamin Franklin Parkway, Philadelphia. Butterflies! at the Academy of Natural Sciences of Drexel University, 1900 Benjamin Franklin Parkway, Philadelphia. Insectarium: Philadelphia’s All-Bug Museum, 8046 Frankford Ave., Philadelphia. Bugseum of New Jersey, 1761 Route 9, Toms River, N.J.